We expect this show to be the best one ever! 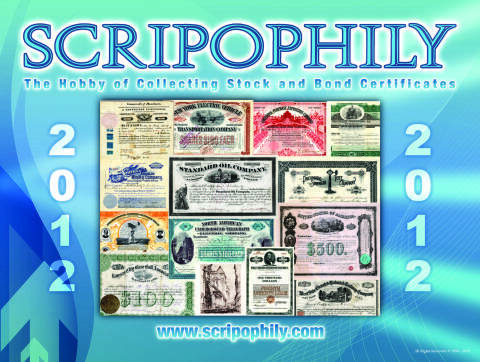 Scripophily.com LLC, the internet’s leading buyer and seller of authentic stock and bond certificates, will be attending the 11th Annual International Stock and Bond Show in Herndon, Virginia. The show will have dealers from all over the world and is expected to be one of the best events ever. The location of the show is the Crowne Plaza Hotel near Dulles Airport and located just 21 miles from Washington DC. It starts on Friday, January 27th to Saturday, January 28th. The show hours are from 9am to 6pm on Friday and from 9am to 4pm on Saturday. Scripophily.com will be offering a free 2012 Historic Stock Calendar to all attendees. In addition, Bob Kerstein, the Old Stock Detective SM and founder of Scripophily.com, will be offering free assessments of stock and bond certificates brought to the booth at the show. Scripophily.com is celebrating its 16th successful year on the Internet and has over 17,500 selections in its online store. Scripophily.com also operates OldCompany.com, which researches old stock and bond certificates to help determine possible redeemable value. Last year was Scripophily.com’s and OldCompany.com’s most successful year ever, with over 1.6 million visitors and 6.5 million page views during the twelve month period ending December 31, 2011. Scripophily.com - The Gift of History has had items on display in the Museum of American Finance in New York which is an affiliate of the Smithsonian Institution. Scripophily.com has been featured on CNBC, USA Today, Baltimore Sun, and Washington Post and in many other media publications. Scripophily.com and Old Company.com was founded by Bob Kerstein, a Certified Public Accountant who has more than 35 years of senior management experience in the Cellular, Cable TV, Satellite, Internet, and the Professional Sports and Entertainment Industries. Bob is also the President of the Professional Scripophily Traders Association (PSTA). For more information on Scripophily.com LLC, please visit http://www.scripophily.com/, http://www.oldcompany.com and http://www.bob.com or call 1-703-787-3552.